ABNER MARES: "I'M READY TO PEAK...EXPECT A GREAT FIGHT FROM ME"
"I'm ready to peak this Saturday and let all the energy and emotions that I have out. I'm ready and hopefully will peak Saturday night...I'm gonna have to show a variety of styles. I'm probably gonna have to change it up round by round. I know he switches to southpaw and switches his strategy in the middle of fights. 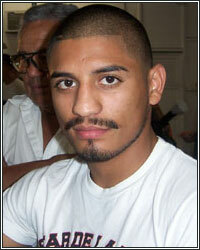 It will be tough, but it will bring out the best in me...expect a great fight from me and look out for Abner Mares. It's gonna be a great fight Saturday night and I'm gonna put on a great performance," stated undefeated bantamweight Abner Mares as he talked about his upcoming clash this Saturday with IBF bantamweight champion Joseph Agbeko in the finals of Showtime's Bantamweight Tournament. Check it out! DK: Abner, thanks for taking the time out to speak with FightHype just days before the biggest fight of your career. DK: How are you feeling physically right now so close to the fight? AM: Physically, I'm ready. I'm ready to peak this Saturday and let all the energy and emotions that I have out. I'm ready and hopefully will peak Saturday night. DK: This fight was originally supposed to take place back on April 23rd, but Agbeko fell victim to a case of sciatica. How disappointed were you being on such a roller coaster from an emotional high after training and coming back down, only to have to be ready again? AM: It was a roller coaster, but that has past. I'm high on energy and excitement to get ready to explode and let everything out Saturday night. It was tough, but that has passed and I'm focused on the fight. DK: Without giving too much away, what kind of things must you do to beat Joseph Agbeko? AM: I'm gonna have to show a variety of styles. I'm probably gonna have to change it up round by round. I know he switches to southpaw and switches his strategy in the middle of fights. It will be tough, but it will bring out the best in me. DK: Abner, can you talk about being included in the Showtime Bantamweight Tournament and what it has meant for your career? You were the underdog when this thing started because nobody really knew who you were before it started. AM: This tournament means the world to me. My first answer, when asked to join the tournament, was obviously "yes" because of the exposure to let people know I'm here. I was excited and then even more excited when I found out I was fighting Vic Darchinyan. I remember dreaming of fighting him and then I beat him. Now I have the opportunity to fight another world champ. People didn't know who I was and nobody was betting on me, and now people know Abner Mares and they are betting on me to win. This tournament has meant the world to me. DK: Being a potential star in the making, and being a young fighter, how worried are you about ring rust since it's been 8 months since you've been in the ring? We know young fighters like to stay active. AM: I don't think it will have any effect. Agbeko hasn't fought since December either. It's gonna be the same for both of us and I try not to think about it. When I came back from my detached retina after one year off, I didn't look bad. I'm always in the gym and I never stop training, so I'm not worried about it. I've had four great sparring partners that have helped give me different looks to prepare for anything with Agbeko. DK: You fought your first 8 fights at 122 pounds before moving down to 118. Is it difficult for you to make 118? AM: It's not difficult, but like anything else, you got to push yourself. I can stay here for at least 2 more fights. I would like to eventually move back up to 122 though. But right now, as long as I stay focused and training, it's not difficult. DK: I picked you to win Saturday night. Not trying to look past the task at hand, but if you beat Agbeko, who would you like to fight next? AM: God willing. I don't want to disrespect Agbeko because he is a great fighter and this is going to be a very tough fight. I'm not looking ahead, but if I had to think about it, Nonito [Donaire], [Anselmo] Moreno, [Fernando] Montiel, or maybe [Jorge] Arce; I hear he is moving down. All those fights would be great, but this fight Saturday will determine my whole career, so I'm not looking past Agbeko. DK: Anything else you want to add before Saturday night, Abner? AM: Just to all the fans supporitng me, and to those who just found out about me, expect a great fight from me and look out for Abner Mares. It's gonna be a great fight Saturday night and I'm gonna put on a great performance. DK: Abner, I know it's a busy time for you and thanks for taking the time out to talk to us again. Good luck Saturday night! AM: No problem. Thank you.